Fisk was an all-star catcher for many seasons with the Red Sox, and will forever be a Boston fan favorite for his game winning home run in Game 6 of the 1975 World Series, back when such “we almost broke the curse!” moments still had meaning. He’d push the then-Red Sox ownership for a higher salary, and GM Haywood Sullivan stupidly let him go as a free agent to the Chicago White Sox, where he’d spend the next dozen seasons or so remaining one of the best catchers in the league. Stats-wise, he’d have his best season in 1985 with the ChiSox when he hit 37 homers and knocked in 107. He’d also catch a Tom Seaver no-hitter. Needless to say, Fisk had no problems getting into the Hall of Fame. As much as he constantly feuded with my Yankees and was in the middle of home plate collisions that led to some legendary bench-clearing brawls in the late ’70s, I always liked Fish as a player. He had constant enthusiasm for the game and an intensity you could feel just watching. Just watch him take a swing at Lou Piniella after Piniella barrels over him at the plate, leading to a free for all back in 1976. Jeez, those two teams absolutely HATED each other in the ’70s! And I vividly remember Sox fans NEVER forgiving the Yankees for this one since Bill Lee got hurt and wound up on the DL. 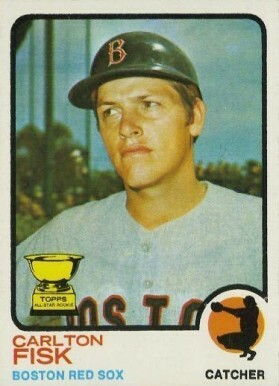 I also like this 1973 card of him since he looks like he’s staring down some schmuck who owes him money. Maybe it’s Heywood Sullivan. Or maybe it’s Lou Piniella. Who knows? I Got A Good Review!